DRIVE, SING AND USE YOUR PHONE, IN COMPLETE SAFETY. 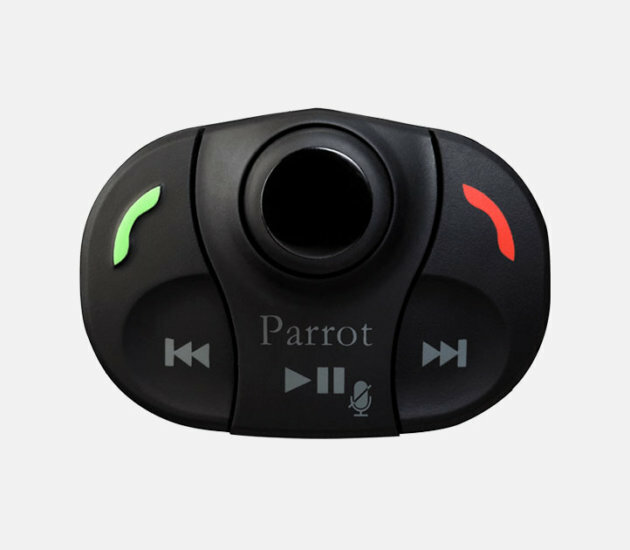 The Parrot MKi9000 system is a Bluetooth hands-free kit without a screen, suitable for all types of vehicles. You can manage your music playlist and your calls either with a simple remote that you can place under the steering wheel or directly with your voice. It couldn’t be easier or more discreet! The discreet Parrot MKi9000 fits perfectly inside your vehicle. Control everything with a voice menu. To make sure that your hands stay on the steering wheel and your eyes on the road, the Parrot MKi system includes advanced voice synthesis and recognition features. Everything is done automatically and without learning – the system simply recognises the contact’s name and calls them. By combining double microphone technology with signal processing software (DSP-3), all ambient noises disappear and your conversations are clear. Parrot MKi9000 puts music front and centre. A special cable adapts to all kinds of music sources – your smartphone’s Bluetooth, USB drive or MP3 player (iPod, Walkman, iPad, Galaxy Tab, etc.). Your car becomes your own concert hall!